Teched Barcelona started with an amazing keynote. Thanks to Björn Goerke. Totally different from last year, it was very technical and completely in the star trek theme! During the keynote, SAP showed very technical demos of different technologies. Very risky but everything went well, so thumbs up! Hope to see similar keynote next year! I went to Teched to find out more about Leonardo and all the technologies behind it. Therefore, I followed sessions of Machine Learning, Blockchain and IoT. The IoT service was already introduced last year but blockchain and machine learning are very new and hot! This Blockchain service in SCP doesn’t mean you must start with Blockchain. It’s very hard to find a useful Blockchain scenario! Just remember: SAP will release this soon and you could use it if you really need it! I’ve been playing around with the “old” IoT service on SCP and I wanted to know how I could enrich these IoT projects with Machine Learning, so I followed a hands-on session. During this session we activated Machine Learning in SCP Cloud Foundry and uploaded a model. We had to do everything from command line. As a developer, I like to use the command line, but you just know that this will change and be adapted into the SCP Cockpit. The model was already prepared and we didn’t change it. (The customizing and training part of the model was not included in the hands-on.) For creating your own model, you’ll probably need another service like analytics but this will not be created in the Machine Learning service. For this Machine Learning service, SAP added Kubernetes to the SAP Cloud Platform. Kubernetes is another Cloud technology that SAP adopted in the SAP Cloud Platform next to the NEO and Cloud Foundry environment. In this hands-on we used python to create a proxy between Cloud Foundry and Kubernetes. I guess this will also change. The biggest new thing on Teched, which was announced in the Keynote, was “ABAP in the Cloud”. This is great news; the future of ABAP is looking good. It will enable us to create Full Stack apps in the cloud on top of ABAP. But, why did they wait so long to do this? This sounds great and big, but is it also that big of a deal? Nowadays, you can download and install ABAP on your local computer. I don’t know much about infrastructure but maybe they had to extend the server center to support this? Talking about ABAP in the Cloud brings me to the next topic, the SAP Web IDE. The SAP Web IDE is everywhere! In every session they talk about the SAP Web IDE. UI5 development, Workflow, IoT, Mobile, … you can develop on all these cloud services with the SAP Web IDE! The only question I have: If ABAP is moving to the cloud, will it also move to the SAP Web IDE? If they also follow the principle of one for the IDE’s, then it will go to the SAP Web IDE. I always thought that SAP would replace the NEO environment with the new Cloud Foundry environment, but I must reconsider my thoughts. Next to NEO and CF, SAP also added Kubernetes to the Cloud Platform and they joined Cloud Native Computing Foundation. It looks like SAP will expand the SAP Cloud Platform with more Cloud technologies and not choosing for one Cloud technology. By adding more Cloud Technologies, SAP will be able to adapt more services on top of the Cloud Platform. The Cloud Platform in general makes it already very easy to adapt new services. 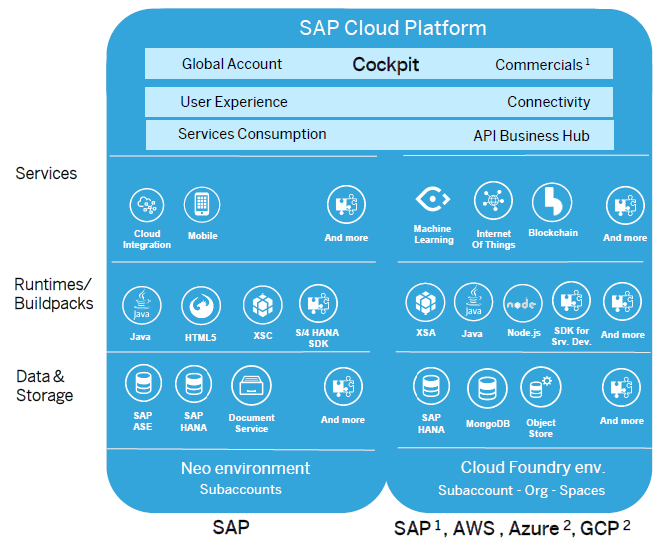 An overview of what the SAP Cloud Platform currently contains and what is running on which environment. Machine Learning is also using Kubernetes, which is not in this overview. Besides all of this, there is much more going on at SAP. With only tree days it’s not possible to get to know everything. To stay up to date with the last updates, you can follow http://open.sap.com . It’s a great platform to learn all the cool stuff of SAP and stay up to date. Looking forward to the next Teched!